Another MIPCON discovery: Nature Cat, a new 2D animated TV series produced by Spiffy Pictures. 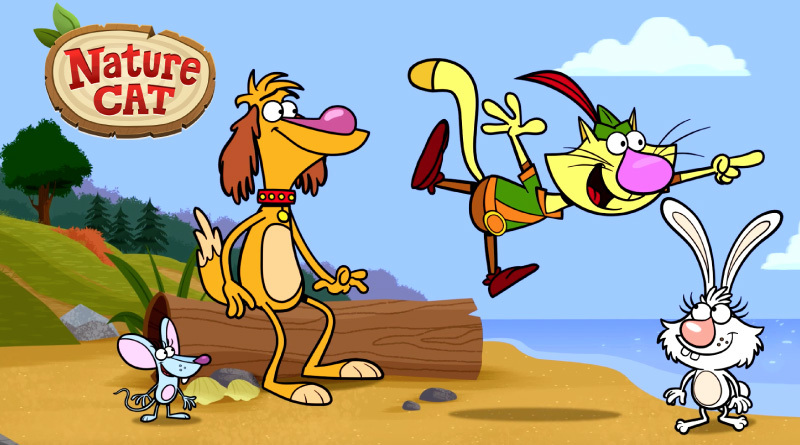 “Nature Cat follows Fred, a house cat who dreams of exploring the great outdoors. In each episode, once his family leaves for the day, Fred transforms into Nature Cat, ‘backyard explorer extraordinaire.’ Nature Cat can’t wait to get outside for a day of backyard nature excursions and bravery, but there’s one problem: He’s still a house cat with no instincts for nature. Like many of today’s kids, Nature Cat is eager and enthusiastic about outside activities, but is at times intimidated by them. With the help of his animal friends, Nature Cat embarks on action-packed adventures that include exciting missions full of nature investigation, aha discovery moments and humor, all while inspiring children to go outside and ‘play the show.’ Through Nature Cat co-creators and brothers David Rudman (Sesame Street, The Muppets) and Adam Rudman (Tom & Jerry, Sesame Street, Cyberchase) have teamed up to inspire viewers to get outdoors and develop connections with the natural world.” Good news, everyone! Nature Cat has been picked up for distribution by PBS Kids. They have an interactive web site for the show.